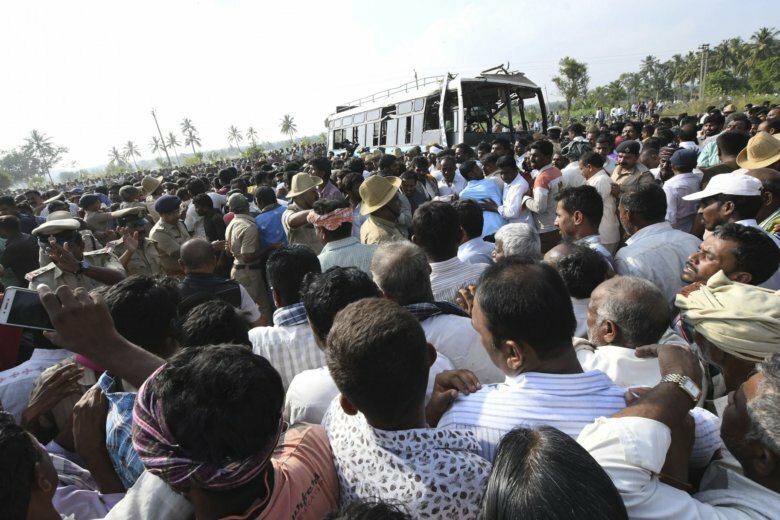 BANGALORE, India (AP) — At least 25 people, many of them schoolchildren, were killed when a speeding bus fell into a canal in southern India on Saturday, an official and media reports said. The accident occurred in Mandya district as the driver lost control of the vehicle while going at a high speed, said G. Parameshwaran, the Karnataka state deputy chief minister. Parameshwaran said a rescue operation was underway, with police rushing divers to the spot. The area is 105 kilometers (65 miles) southwest of Bangalore, the state capital. The Press Trust of India news agency reported that many of the dead were children who were returning from school. The victims were unable to come out of the bus, which had fallen on its side, trapping the doors on the floor of the canal, the NDTV news channel said. Around 150,000 people die every year on India’s roads, often because of reckless driving, badly maintained roads and vehicles overcrowded with passengers. Deadly bus accidents are common in the country. In July, 48 people were killed when a bus crashed into a gorge in Uttarakhand state.